Bold, simple designs are always winners with kids and eye-catching, good quality tees like these are fail-safe for parents. So if you like the look of them and like the sound of a great discount, read on. 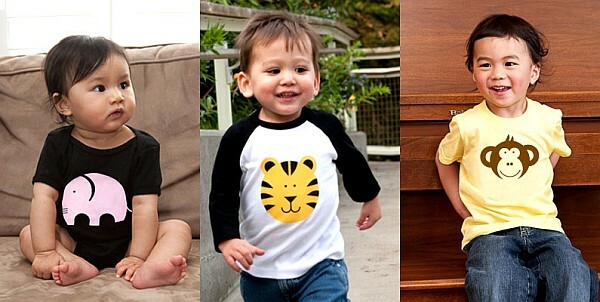 Colette Kids offer a great range of long and short sleeve tees and onesies for babies, kids and mums and dads. Created in San Francisco and made in America, there is a stunning choice of designs of individually screen-printed tops made with eco-friendly dyes. They are made from cotton with an organic range to boot. What I particulary love about these is that they are mostly non-gender specific, so no girly-girl tops, just striking, colourful casual t-shirts. Prices start at US$23 plus shipping. Colette Kids are also offering Babyology readers fifteen per cent off throughout July – just enter the code SAVE15 at the checkout. Happy shopping!